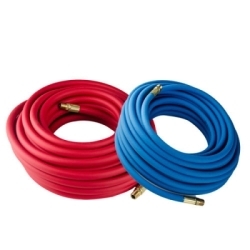 1/2"ID x .813" OD Blue POLYAIR® Multi-Purpose Air Hose Assembly | U.S. Plastic Corp. This 1/2"ID x .813"OD Blue POLYAIR® Multi-Purpose Air Hose Assembly has a working pressure of 300 psi @ 70°F. Weight of roll is 9.0 lbs.